Hello! We are in Apple Valley, Minnesota tonight, less than 36 hours away from the Monday start of the Coulee Challenge 1200K. The big event is almost here. In case you are wondering about our state of mind, I have the usual pre-1200K mix of anticipation, confidence, tempered with a bit of fear. Why fear? Mostly, for this event, it’s because we’ve been out of the randonnee game for a number of years. Mary and I last rode a full 1200K six years ago (High Country in Colorado), and our longest since was a 1000K (Appalachian Adventure) in 2014. We have only ridden annual 600K rides in the years since — we have managed long two-day distances, but not the four days it will take us to complete this ride. So who knows how our 2018 bodies will respond? All that said, we have a good feeling about this ride, as it’s hilly but with no extended climbing. 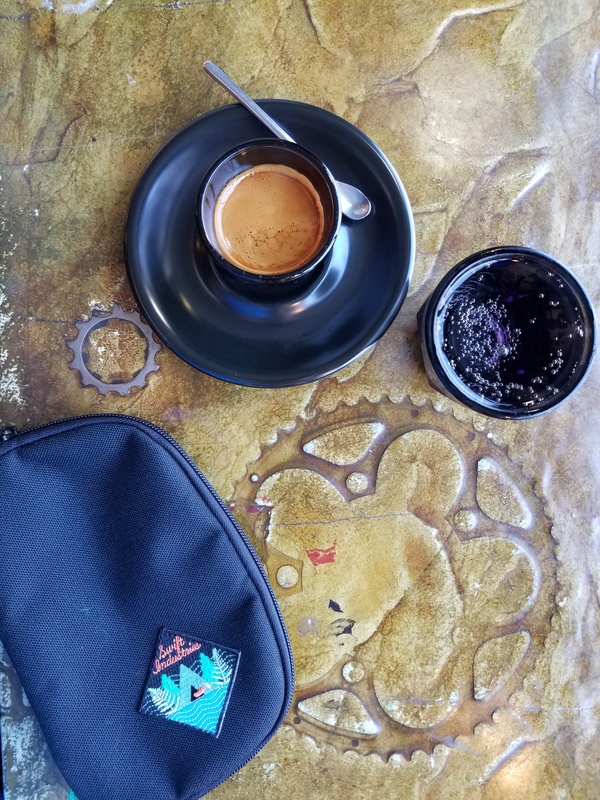 Our training seems solid, with two 600K rides this year, and a number of long training rides on top of the D.C. Randonneurs annual spring brevet series. I’m also hoping our experience will help us out during the low points. This will be our fourth 1200K on tandem, so we know the drill: ride, eat, sleep, ride, eat, sleep. Get coffee where you can. 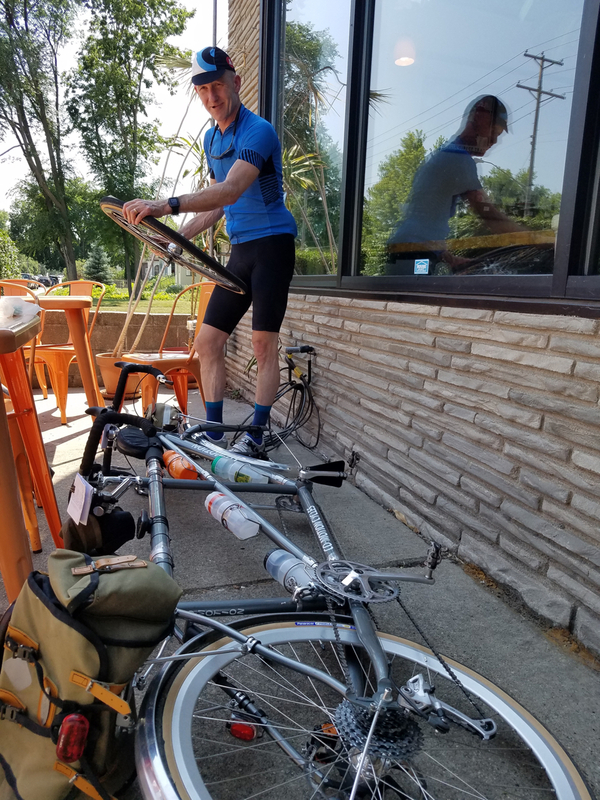 It also helps our confidence that the Minnesota Randonneurs appear to have this event well planned, with hotel stops each night and drop bag service, so we don’t need to carry much more than rain jackets and warmers. We also have had an uneventful arrival and setup, which has taken off the stress. 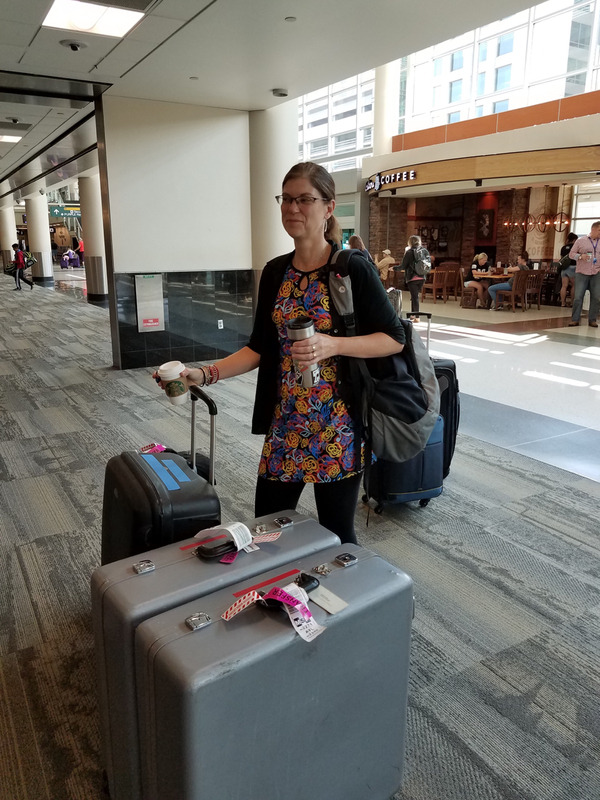 Our Thursday morning flight from Washington on Southwest Airlines and an Uber ride got us in nice and early to our hotel near the start. Apple Valley, south of St. Paul, appears to be mostly a nondescript residential area, but there are plenty of big box services around us. We have been walking to the Cub Foods for our dinner and sundry shopping needs, and Target for the Starbucks inside. Also there is the ubiquitous Noodles and Co. across the way for edible if not gourmet fast food. By Thursday evening I had the Java tandem out of the cases and built up before we fell into bed. Friday was shakedown time. 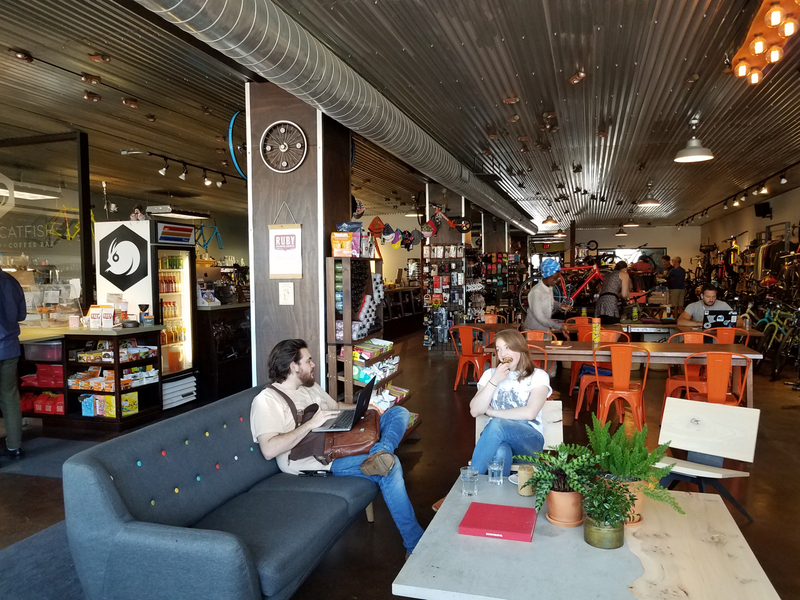 Our destination was south Minneapolis to the well-known Angry Catfish bicycle and coffee shop. The planned 17-mile route there had a flaw, however: it used the Cedar Ave. pedestrian bridge, though we didn’t know was unavailable due to construction until we saw the dreaded “trail closed” sign. With directions from a helpful runner, we detoured via the dirt road along the Minnesota River to the Mall of America area. The road had a couple of soft spots that forced us to dismount but was otherwise rideable. I wasn’t happy about riding the pristine clean Java on dirt but recent rains appear to have tamped down the dust. They also seem to have invigorated the mosquitos, though, so we tried to keep moving. Coffee and much gazing upon the luxe offerings at Angry Catfish ensued upon our midday arrival. 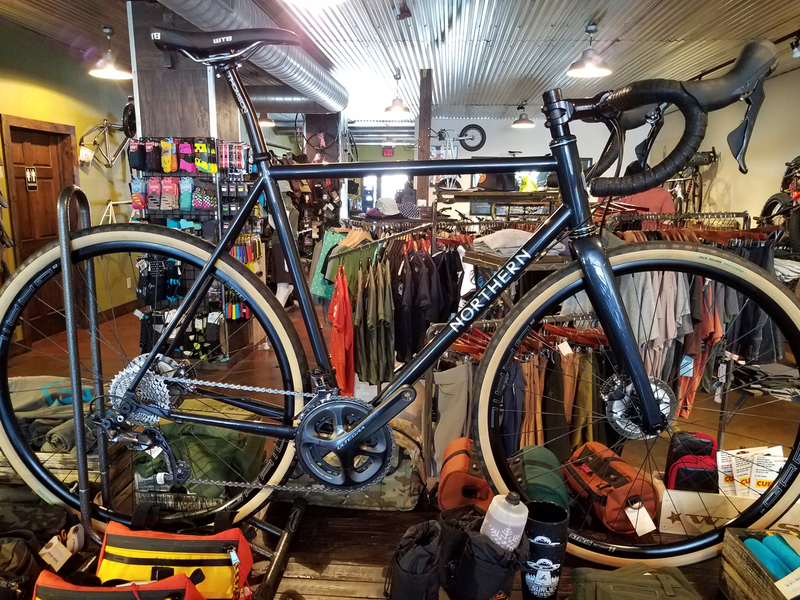 They sell their own brand on beautiful custom bikes, Northern, and stock high-end components, clothing and bikepacking gear. The staff was super nice to us. I got a nice little tool organizer by Swift Industries, an Angry Catfish bottle, some socks, and Mary bought us a new inner tube. While we hung out our front tire went flat because of a pinhole by the stem. Luckily we happened to be at a bike shop. 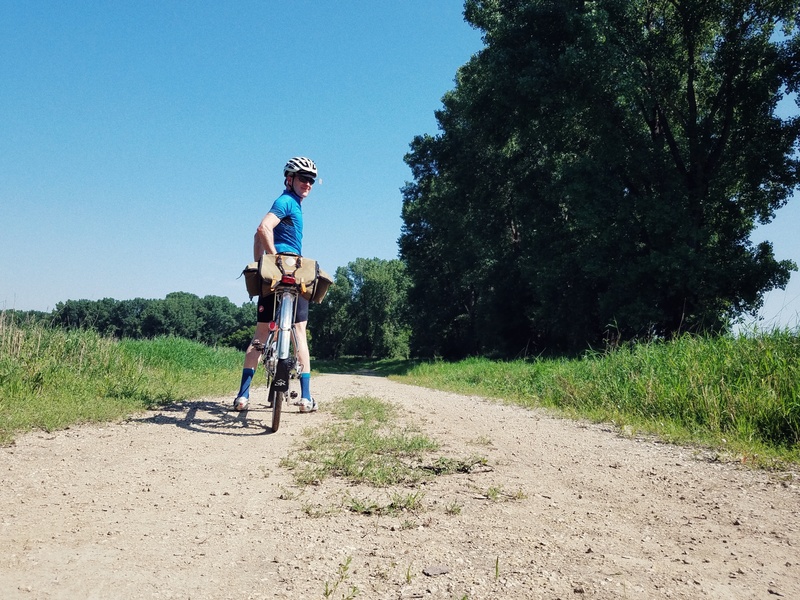 We took an alternate route back to the hotel via Fort Snelling to avoid the dirt road, but it involved local paved trails, which are always hard to navigate for the first time. Our phones and Google Maps were used a few times, despite my best efforts at a cue sheet. We also stopped in at the Sierra Trading Post outlet store in Eagan just to see what they had, but found no treasure to take home. On Saturday we rode 25 miles out on the course with our pal Tim Foon Feldman from Boulder and another Colorado randonneur, Oksana Kovalenko. The weather was bright and hot, and there was only light traffic on the farm roads. We had a fun time gabbing along the way. Tomorrow we plan to go to inspection, pack and re-pack our drop bags a couple of times, visit with acquaintances at the start/finish hotel, and otherwise kill time until we hit the road on Monday. Oh and we’ll try to bank sleep tonight and tomorrow. We won’t get much during the ride itself — three hours a night is likely if we are to hit our goal of a finish around 80 hours. Thanks for reading, and watch this space for short updates from the event! I feel your pain. I rode into St Paul from the south and found navigation very irritating. At least my detours didn’t involve dirt. Best of luck during the event. I grew up in N. St. Paul and attended Carleton College in Northfield. Hope you enjoy your Minnesota adventure! August can be as brutal there as here in Maryland.